We moved from our 50’x100′ “city” (WM3O told me it was “suburban” because I couldn’t walk to an Asian grocery) lot to a nice “suburban” (semi-rural) lot of just over an acre in October 2013. In order to work the November DXpeditions and contests, I hastily erected the hexagonal beam on surplus fiberglass poles, as well as the 80-m vertical and a 40-m dipole. Also, put up several Beverages (yay!!!). The hex has survived some modest wind gusts, which surprises the heck out of me. I thought it would have been on the ground by now. Managed to work K9W, T32RC, and T33A on 80m (as well as other bands), which made me happy. Did not manage to work Z81X (on 80m) through the EU. Put in a nice 19-hr effort in CQ WW CW, SOAB-HP “CLASSIC” (one radio, no spotting), about 1.5M. It’s nice when WW is before Thanksgiving. Repaired a number TS-930Ses for people. I think mine will be on the bench soon since the sensitivity appears to be shot. More TS-930Ses. I have one still to fix in my queue, plus mine. Keep refreshing LoTW until the 99 DXCC I presently have confirmed on 80m rolls over so I can apply for 5BDXCC. I have cards for even more on 80m, but I’d rather do it all on LoTW. Getting some VHF antennas up. Editing my junquebox and ham equipment holdings, mostly parts. Anybody need some big air inductors and variable capacitors? 6-el 220 beam? Getting on 160 and 30 meters, better antenna for 40. Working FT5ZM on at least one band/mode. Re-installing antenna switching hardware. Right now I have to run across the basement to move coax. And, a special project that you’ve probably heard about but do not yet realize…details to follow. So, Happy New Year and I hope your 2014 holds as much interesting and promising to do as mine does! 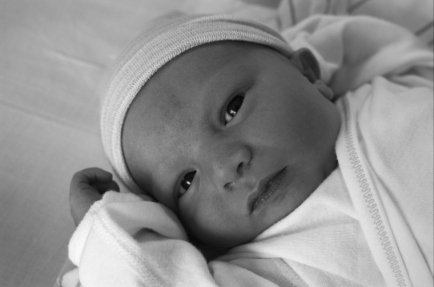 Early Monday morning, the day after Field Day, we welcomed our son Evan into the family. We were so right to stay home! As good friends have opined “your life will change…for the better.” So far, I would tend to agree. The blog will receive (even more) infrequent updates, K8GU may be a little less active on the air, and there will be fewer homebrew projects over the next few weeks and months. A few months ago after building some UHF antennas when I pinched the palm of my hand with a pair of pliers, I watched the blood blister heal and commented to Sarah on how amazing it was for several days straight. “You think that’s amazing? Well, I’m growing new life inside of me.” We laughed, but it’s very true. Every day is something new: grasping, gazing, grunting, and gurgling. This is only the beginning. That’s pretty amazing. This is a follow-up to a post from Sunday. On Wednesday night, Sarah handed me an envelope from the day’s mail that had the appearance of a QSL card. I took out my knife and opened it. It had a some sample QSL cards, along with a brochure inside. I scratched my head for a moment and concluded that I had just received my first QSL card for a blog post. This curious turn of events brings me around to a couple of points. For those of you who don’t know, this blog is aggregated by AmateurRadio.com (and it is syndicated on my Facebook profile). My agreement with the owner of AmateurRadio.com is that he provides me with visibility in return for select content from my blog. The QSL printer who sent me the samples is one of his advertisers. Thanks, by the way! The cards were very beautiful and of high quality and I will consider him to print photo cards for my next DX operation. In full-disclosure, I received nothing from the printer who printed my cards in return for mentioning them. But, I should clarify that the blog is something I do for fun and I’m not really in the business of product endorsements. A final point of clarification is that my beef with the available QSL cards was not so much the quality available, but amount of semi-relevant stuff hams try to cram onto the card. I guess if 10 meters ever opened up again regularly, we might start getting asked for our “Ten-Ten” numbers again. After listening to the V31BB clip about the secret decoder ring, I’m sort of ashamed to admit that I have one. Strike that from the card! The long and the short of the original post was that I wanted an uncluttered, distinctive card. And, I think I found it. It looks like the site migration has gone relatively painlessly. Although, I think I lost 2-3 posts (the Square Rigger Briefcase and Angostura LLB posts are the ones I remember) in the conversion from Joomla to WordPress. 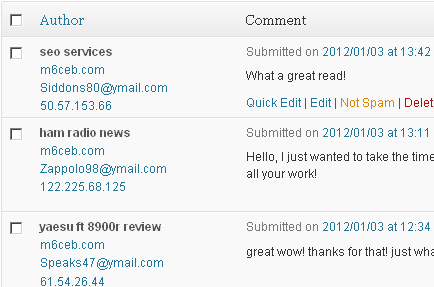 I need to reload the images from the original WordPress posts (from the blog.k8gu.com days) into the new WordPress. The images from Joomla had to be moved into the WordPress posts by hand, but since there were only about fifty posts, this was not a big deal. I used a modified version of this script to dump my Joomla articles into a dummy WordPress installation/database table that I set up on the QTH.com server. Then, I exported from that WordPress installation in WordPress XML format so I could test the import on my server here at home, as well as importing the old WordPress posts from pre-2008. Bingo. I just cleaned-out the old Joomla and WordPress files and database tables at QTH.com then replaced them with the new WordPress installation. I’ll be adding the images from the old WordPress posts back in slowly. The Quiet Way: Dad’s blog about transition from almost 30 years of 8:00-4:30 to a different phase of life. We like the photographs. The Road to the Horizon: If you’re a ham and you’ve worked any rare DX in the past 15 years, there’s a good chance you’ve worked Peter Cassier, ON6TT, as he travels The Road to the Horizon working for the U.N. or searching for the latest adrenaline kick. He’s passionate about world problems that don’t get the press they deserve, too. Those Damn Contesters Have Ruined Ham Radio: We’ve all heard that line before. Scott Robbins, W4PA, who’s a VP at Ten-Tec and an avid contester, shares his candid opinions and experiences on the hobby. Since 2001, I’ve had access to a server (palau.onu.edu) colocated at my alma mater. However, due to lack of interest by current students, this server has become increasingly unreliable to the point of not being rebooted for almost a month after the latest crash. I have moved the gallery to this server (as I have intended to do all along) and updated it with pictures from our recent travles.